Everybody knew that Luka Doncic was going to be a great NBA player for years to come. However, what nobody could have predicted was just how quickly the young Slovenian would adapt to the NBA. The third pick in the 2018 draft started playing regularly for the Dallas Mavericks at the end of October and hasn’t looked back. 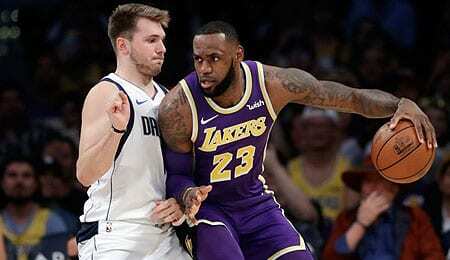 Doncic is currently on course to be the most successful European player who has recently joined the NBA and bookmakers already have him as the firm favourite to win the NBA Rookie of the Year award. We here are all on the Doncic bandwagon and if you are like us you can click over here to place a bet on the talented youngster and earn some money in the process. Doncic was set to be the first pick of the 2018 NBA draft. He came from the second best basketball league in the world (the Euroleague) and also came from one of the most decorated basketball clubs in the world, Real Madrid. If that wasn’t enough, Doncic bossed the Euroleague in the 2017-2018 season and convincingly won the MVP award. About the only thing he can’t do is swing a golf club (see video below). However, before the NBA draft for one reason or another concerns started creeping in regarding his NBA readiness. Many people claimed that Doncic wasn’t athletic enough and that he didn’t have enough stamina for the NBA. This resulted in the Slovenian dropping down on draft day and the first pick turned out to be Arizona’s Deandre Ayton. Doncic didn’t get picked second, either (with Sacramento grabbing Marvin Bagley III), and was close to being left out of the top three when something amazing happened. In a move that is set to become part of Mavericks’ history, Dallas saw the potential in Doncic and offered the Atlanta Hawks Trae Young (who the Mavs had taken fifth overall) and its 2019 first round pick in a bid to land Doncic, who Atlanta had taken with the third pick. The Hawks agreed and the talented youngster became the player that Dallas will rebuild its franchise around. This should be enough of a reason for all Fantasy players who are having second thoughts regarding Doncic to include him on their teams. If Dallas went to such great lengths to acquire the Euroleague MVP, then you should do the same. If Dallas scouts are not enough for you to make up your mind and pick Doncic on your Fantasy team, then maybe his impressive stats will convince you. Despite a recent skid, the 6’7″ forward is shooting over 43 per cent from the field and has hit an impressive 35.5 per cent of his shots from behind the three point line. He’s scoring 20.5 points per game and pitches in with almost seven boards and 5.4 assists per game. Remarkably, Doncic is the first teenager in NBA history to put up more than one triple double in a season. He’s also the youngest player to record a triple-dub with at least 30 points. The previous record holder? Some dude named LeBron James. You may have heard of him. Speaking of rare company, if you compare Doncic’s numbers to other all-time great rookie seasons, you can see that the only players to have had better numbers than the Slovenian are part of an elite group. This group includes players such as Michael Jordan (who actually averaged fewer boards), Kareem Abdul-Jabbar (who had fewer assists), Larry Bird (fewer assists) and Grant Hill (who had fewer points, boards and assists). That should convince you how good Doncic is and what kind of ceiling he has. Now it’s your turn. Let us know in the comments below where you think Doncic will go in next year’s Fantasy drafts.